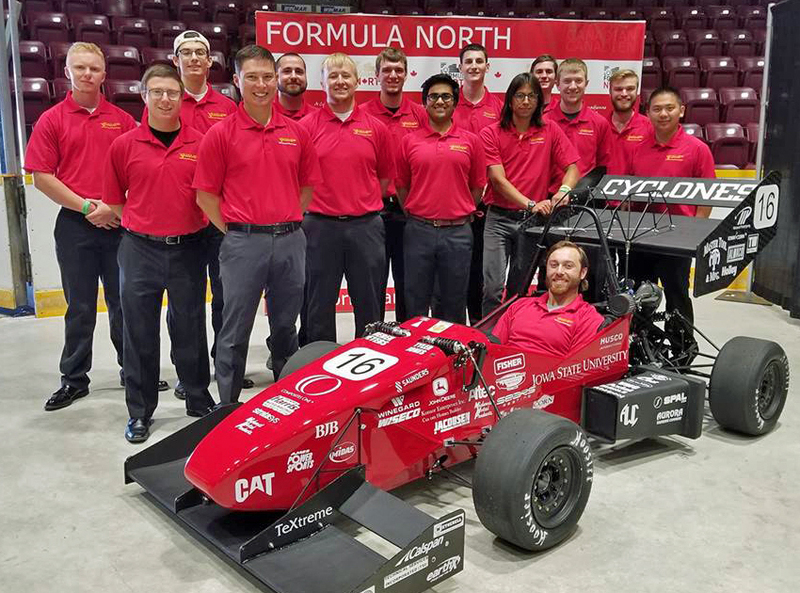 Iowa State's Formula SAE team recently competed at Formula North in Canada. Team members who made the trip are, left to right, Luke Schultes, Peter Chiodo, Justin Joines, Daniel Konsor, Derek Peters, Jacob Keeley, Jacob Weltz, Ravi Shah, Kevin Kassel, Parker Purcell, Ryan Saunders, Brad Bauer, Paul McNicoll, and Mingzhe Liu. Nate Lenz is in the racing car. Larger photo. Photo courtesy of Formula North. AMES, Iowa – They’ve already run four parking lot simulations of the nearly 14-mile endurance race that’s such a challenge to students and their mini open-wheel racing cars. They’ve already solved a few problems during their season-opening competition earlier this month at Formula North in Barrie, Ontario, Canada. They’ve already figured out how to drop their car’s weight by almost 25 pounds and how to engineer more efficiency into their car’s front and rear wings. And so the student-engineers who designed and built Iowa State’s formula racer are looking forward to the season’s final test June 21-24 at Formula SAE Lincoln in Nebraska. The competition is sponsored by SAE International, formerly the Society of Automotive Engineers. Last year, Cyclone Racing left Lincoln with a fifth-place trophy (of 70 scored teams). “We definitely had high hopes for Formula North,” said Nate Lenz, a senior in mechanical engineering from Sioux Falls, South Dakota, and the team’s technical director. But, as often happens at these competitions, an unexpected component failure made for some quick thinking and some fast repairs. In this case, the custom muffler built by the students wouldn’t pass noise inspection. So a plug went in. That cost the team some power and it eventually caused the muffler case to blow out. The team, however, came away with top-10 finishes in cost of manufacturing, design engineering and skid-pad cornering. Overall, Cyclone Racing finished 16th of 25 scored teams. Now the car is back in the team’s campus shop and Lenz thinks the team is in good shape. A heavier, stock muffler will replace the custom one. But that’s partially offset by taking nearly 25 pounds off the weight of last year’s car by building lighter wings and eliminating radiator covers and other body work. In addition, Lenz said the car’s over-the-top, gooseneck mount for the rear wing has increased aerodynamic efficiency. The new, push-button shifting system has been good for the drivers. And the high-compression piston is boosting power. So the car is fast? And all those long simulation runs? 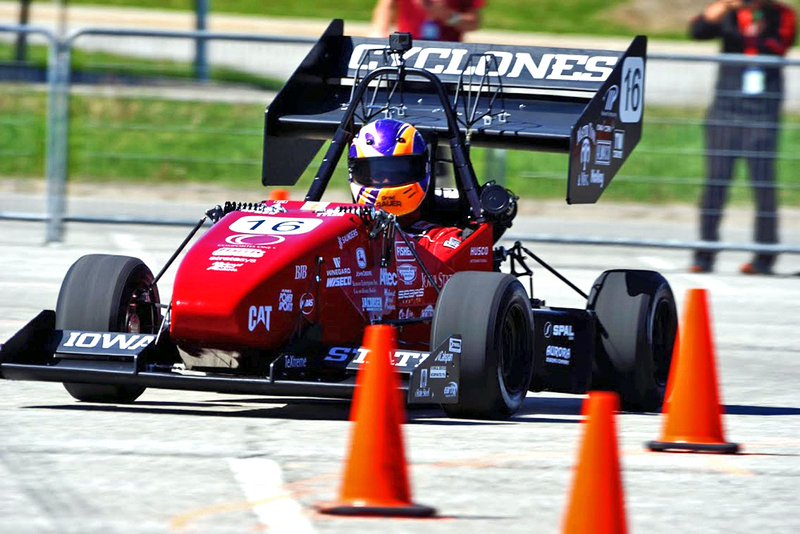 Brad Bauer drives Iowa State's formula racing car at the Formula North competition early this month in Canada. Larger photo. Photo courtesy of Formula North. Iowa State's formula racing team is preparing for the season-ending race in Nebraska. The team has already solved race-day problems, completed long test runs, built a lighter car, improved aerodynamic efficiency and made gear-shifting easier on the drivers. All that has team leaders expecting to bring some speed to the race track.